This series of handy 32-page booklets is edited by D A Carson and Timothy Keller, and addresses key areas of Christian doctrine from a Reformed perspective. Each booklet is engaging, direct, deeply biblical, and is ideal for seekers and Christians looking for clear statements of belief. About "The Restoration of All Things (Gospel Coalition Booklets Series)"
“Christ has died, Christ has risen, Christ will come again!” This foundational liturgical refrain reminds us that what God has already achieved in the past through the life, death, and resurrection of Christ is the foundation for what Scripture says he will do in the future, at the consummation of all things. In this booklet Sam Storms examines the essential elements of Christian eschatological hope—including bodily resurrection, judgment, hell and eternal punishment, and heaven in the presence of God—to show that this hope is a confident expectation rooted in the historical reality of what transpired in the life and death of Christ. Storms examines the inauguration of God’s sovereign rule in the first coming of Christ in order to explore the implications of the consummation of the kingdom of God, the “blessed hope” of the Christian, and the controlling theme of biblical eschatology. 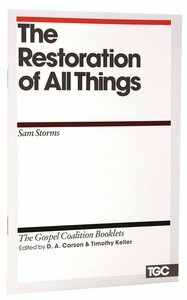 The Restoration of All Things is a Gospel Coalition booklet designed to offer a thoughtful explanation for point 13 of the ministry’s confessional statement. The Gospel Coalition is an evangelical renewal movement dedicated to a Scripture-based reformation of ministry practices. Sam Storms (Ph.D., University of Texas at Dallas) is the founder of Enjoying God Ministries in Kansas City, Missouri. He is a former pastor and professor, most recently, visiting associate professor of theology at Wheaton College. Storms is the author of several books, including Chosen for Life, Signs of the Spirit, Pleasures Evermore: Life-Changing Power of Enjoying God and One Thing: Developing a Passion for the Beauty of God. In this brief overview Thabiti Anyabwile and J. Ligon Duncan outline central teachings concerning baptism and the Lord’s Supper. A Gospel Coalition Booklet. An overview of the doctrine of revelation. Phillip explains what the Bible teaches about the nature of truth and applies it to the Christian life. A Gospel Coalition booklet.